For more than a decade, I have searched and wished for an old spool cabinet. I have found plenty on ebay and occasionally in antique shops, but they have always been price prohibitive. Yesterday my husband and I stopped by our local antique shop (Kelly’s Real Deals) looking for a small side table, and I stumbled upon the treasure I had been seeking . 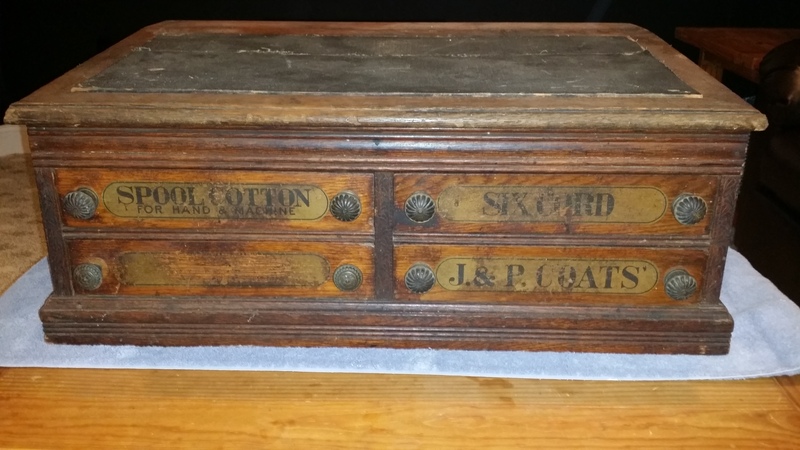 . . a lovely old J&P Coats thread cabinet. It was mostly buried under a pile of china, a walking cane, candleholders, a brass scale, and other odds and ends. After excavating it from the pile and checking it out thoroughly, I made my negotiations with the proprietor and loaded it up in the car. Keep in mind that Kelly’s is basically a barn, and the items you find there are by no means picture perfect refinished antiques. That’s part of what I love about it. It has 4 drawers and the top is hinged and opens up. I covered the black insert in the top with a piece of black fabric, and I lined the drawers and inside the top with blue felt. I will spend a little time researching this, but I know these cabinets were made for merchants starting in about 1877. J&P Coats merged with Clark in 1952. So this cabinet would have to date somewhere in that range. I’d love to narrow it down further. 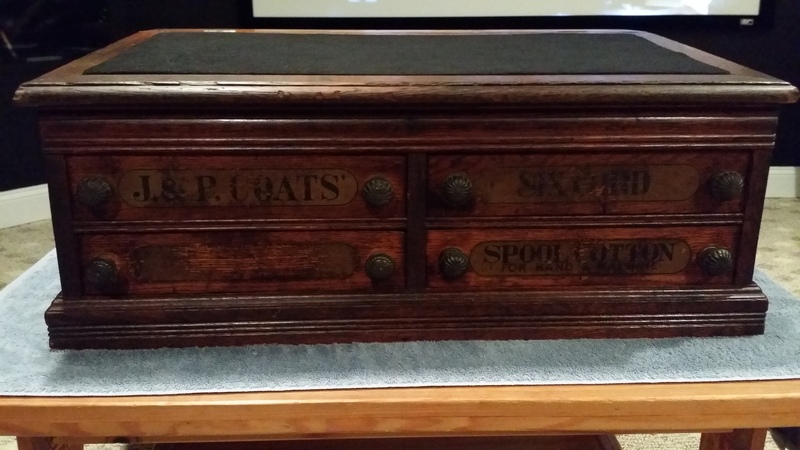 The knobs on the lower left drawer are replacements, but the others are original. The labels on the drawers are original. The one that is rubbed off would have said “Best”. You can buy new labels for these, but I intend to leave everything original. I will probably use a little wax paste on the wood to condition it a little, but for the most part I plan to leave this as-is. I can’t wait to fill it with needlework supplies! I cleaned the piece a second time and used a paste wax on it. LOVE the final outcome. 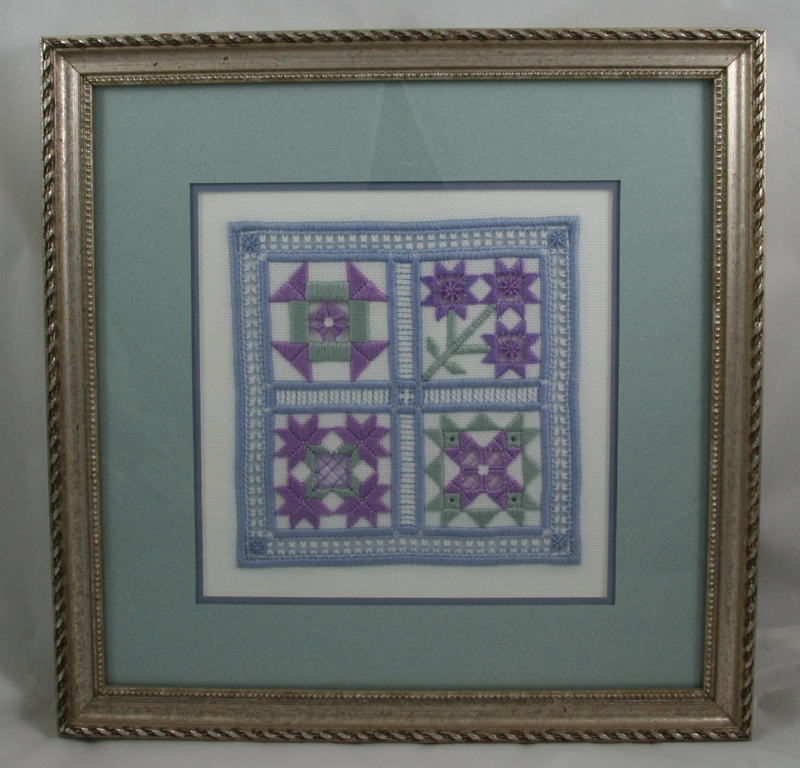 I’ve had this set of holiday needlework designs by Lizzie Kate for years. I decided to start with the Halloween piece. It was quick and fun. I don’t even remember when I did this piece of needlework . . . probably BC (before children). I recall that the intent was a study in textures. There are only two stitches repeated in this design, but the fibers vary from cottons to silks to wools to metallics, giving the piece a lovely variety in texture. 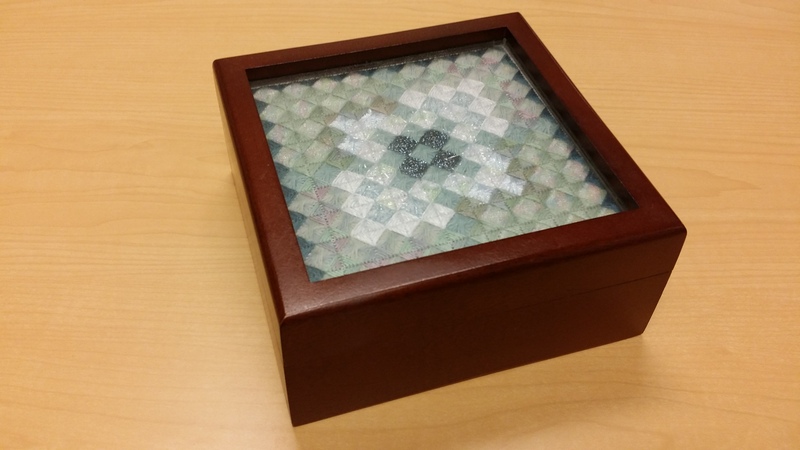 I keep this box on my desk at work to store post-it notes and other odds and ends. It’s nice to know really talented people! 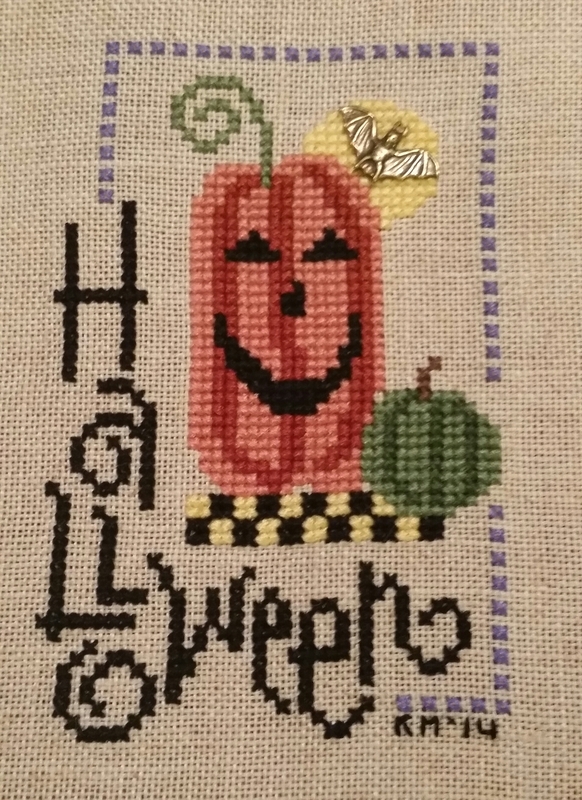 This needlework piece was designed and taught by a friend in my former EGA guild, Edie Feisner. 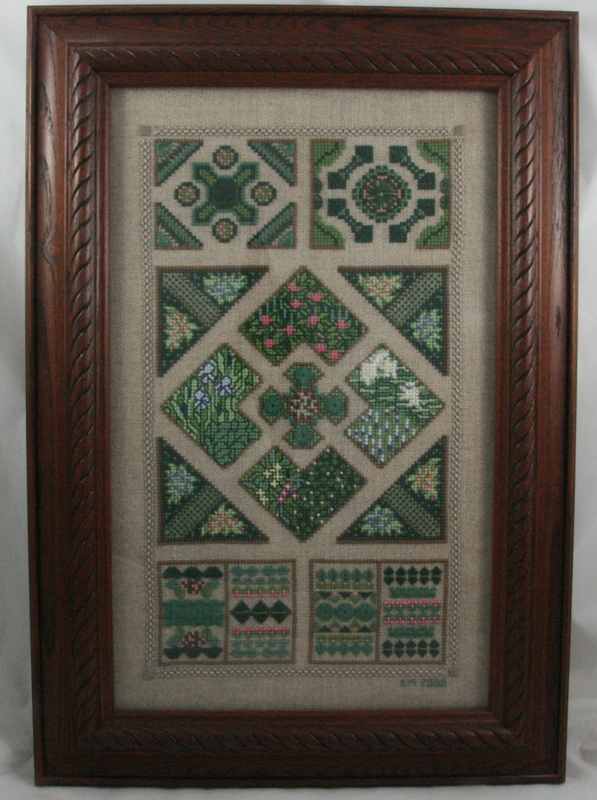 It’s a hardanger adaptation of classic quilt designs. Edie is an expert in color, having published several books and taught at the university level for many years. Sorry for the poor photography on this one — I got a reflection no matter what I tried. I have collected jesters and masks since I was a little girl. 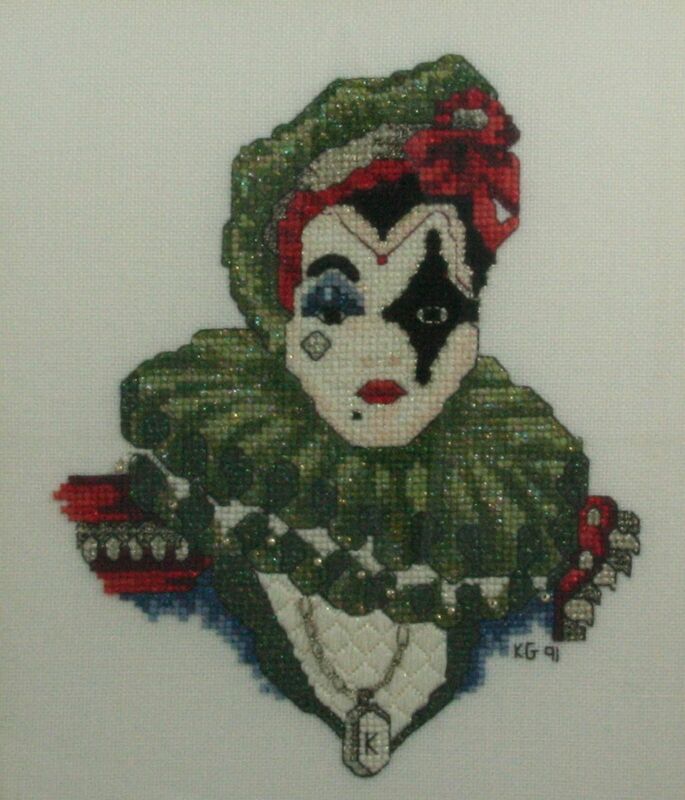 I don’t collect jesters really any more, but I still cherish this piece that I did when I was in college. It was a huge pain to stitch, with lots of blended colors (1 thread each of two different colors) and metallics throughout. It seemed like a constant battle with knots. But it is a stunning little piece. I believe this design came out of an old “Just Cross Stitch” magazine. The artist was Jeanne Christine. This is a piece of needlework that I stitched in 2000. It is designed by one of my favorite needlework designers, Liz Turner Diehl, and it is entitled “16th Century English Family Garden”. I have quite a few of Liz’s garden designs in my stash that I’d like to stitch one day. I enjoy her pieces because of her use of a lot of different stitches and stumpwork. They are always a bit of a challenge for me, but an enjoyable learning experience. 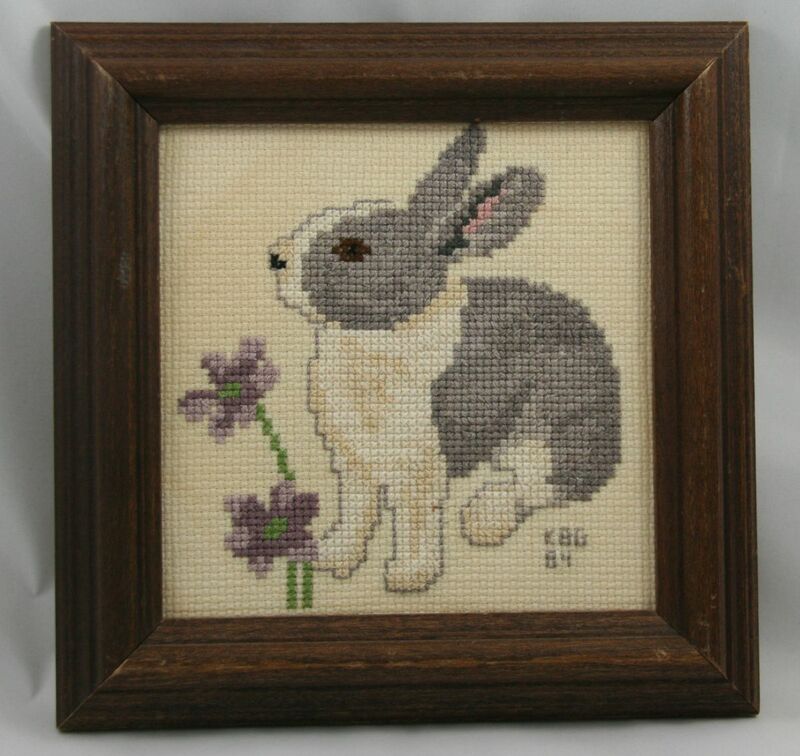 After my needlework beginning in school, I asked my mother if I could do a piece of cross-stitch on my own. She took me to the “Old America Store”, a large format craft and home decor store in Richmond back then, and I picked out a cross-stitch book of baby animal designs. Mom wasn’t a cross-stitcher herself, so I really had no guidance. This was my first piece on my own. Things that I didn’t know when I started this piece: 1) cut your fabric well larger than the finished design size (hence this frame being right up to the needlework) and 2) all the Xs are supposed to go in the same direction.